Ringworm Sources, Symptoms, Treatment, Home Remedies and Skin infections in Humans, in Cats, in Dogs discussed with experts. 1 Who Gets Ringworm of the Nails/Tinea Infection and How? 3 How to Treat Tineal Unguium? 4 What To Do if Treatment Doesn’t Work? Tineal Unguium – also known as Onychomycosis is the most common fungal infection of the nails experienced among adults in the entire world. While the illness is sometimes referred to as “Ringworm of the nails”, the infection itself does not necessarily involve a worm. Who Gets Ringworm of the Nails/Tinea Infection and How? Tinea Unguium causes the toenails to become brittle, thickened, and discolored. If the infection isn’t stopped it will begin to affect the skin beneath the toenail, eventually causing swelling and significant pain. Most common occurrences of Tinea infection don’t cause pain or even noticeable physical discomfort to sufferers. Tinea Unguium is most common in people who are at a generally heightened risk of infection. This includes the elderly, people with diabetes, people with poor blood circulation, and people with a family history of fungal infections. Environments with high humidity promote the growth of bacteria. For this reason, artificial nails, or any objects that a person might put over their nails to hide the infection may actually trap in moisture and make it worse. People who sweat often and in high quantities are also at heightened risk of infection, especially if they already suffer from tinea pedi, or athlete’s foot. Generally, Tinea infections can be quickly diagnosed because they are visually distinct. There are four different varieties of Tineal Unguium with the most common being Distal Subungual Onychomycosis. The other, rarer forms of infection may require laboratory testing for an official diagnosis. How to Treat Tineal Unguium? The first step in any treatment plan, should be visiting your doctor. Many times people suspect they have a fungal infection when really they have non-infectious damage on their toenails. When a patient is diagnosed with a full fungal infection it can take over a year to fully treat. Once the infection is stopped, the nail must have enough time to regenerate itself with healthy growth. The most common treatments for Tineal Unguium or Onychomycosis have been oral medications like griseofulvin or ketoconazole. However, some of these drugs, like Ketoconazole, carry fairly dangerous side effects. Topical anti-fungal treatments can also be used, though they’re generally less effective and more inconvenient to apply. More recently, drugs like Triazole and Allylamine have been adopted as the primary treatment for Onychomycosis. One popular form of these drugs is called Terbinafine, which is especially good at treating the most common form of Onychomycosis, but not as effective against the other forms. These newer drugs are much faster-acting and more permanently effective. Before trying any form of medication however, patients should contact their doctors. There are few but severe cases where patients developed blood conditions and cholestatic hepatitis as a result of taking the medication Terbinafine. What To Do if Treatment Doesn’t Work? It’s fairly common that treatments fail to cure a fungal infection. Often a treatment or medication will work for a period of time, but then the infection will recur. There’s not a lot of reliable data on how and why treatments recur. Some researchers believe it may have to do with an evolving resistance to drugs among fungi. Generally, if one form of treatment fails initially, doctors may perform additional, mycological tests to determine if the fungus is actually Tineal Unguium or something else. From there additional treatments may be applied. RINGWORMSKIN is the leading online resource for information, tips and advice about ringworm, its symptoms, causes and treatment. RingwormSkin was founded in October 2015 by J. Williams. RingwormSkin provides the expert advice you need to stay healthy. If you or your pets have ringworm, RINGWORMSKIN.COM is the all-in-one site for symptoms, causes and cures. 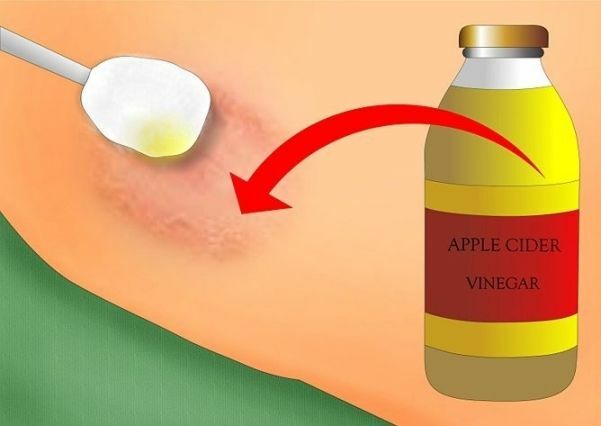 Apple Cider Vinegar: Does it Works to Cure Ringworm? Recurring Ringworm: Why Ringworm Keeps Coming Back? NOTE: RingwormSkin.com is a participant in the Amazon Services LLC Associates Program, and we get a commission on purchases made through our links.